Back in 2010, Amazon believed that the next big platform would be voice, and their goal was to build a computer in the cloud that is only controlled by your voice. Amazon reached that goal when it released the Amazon Echo in 2015. 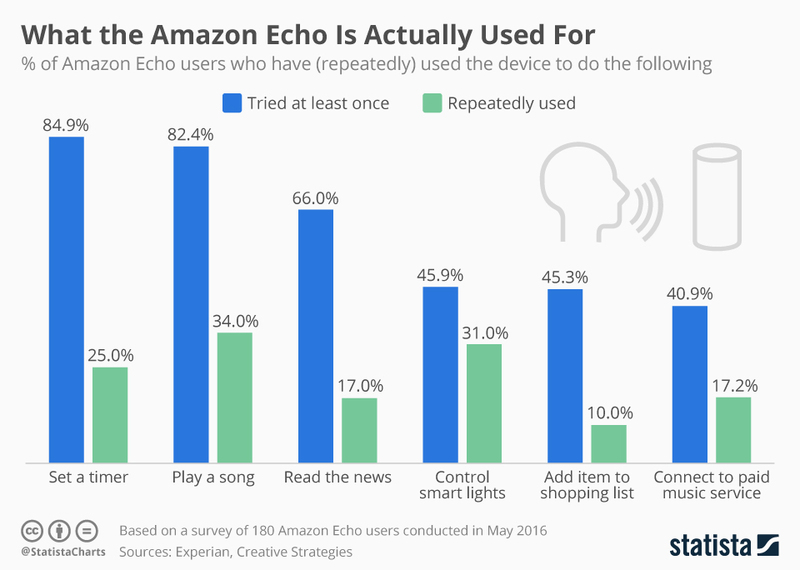 The original plan for Amazon Echo was to build a voice-controlled, intelligent home appliance that could play music, read the news and order groceries by allowing users to talk to it from anywhere in the house. Since its inception, the Echo has become Amazon’s sleeper hit. It’s hot and people are buying it. Amazon Echo has become the standard for a new computing paradigm that thrust Amazon into competition with Apple and Google. Using the Alexa platform, Amazon Echo is capable of voice interaction, playing music, making to-do lists, setting alarms, streaming podcasts, playing audio books, providing weather, traffic and other real-time information. It can also be controlled by other smart devices for the purpose of home automation. With the new built-in visual screens, you can see the delivery person at your front door, check in on a sleeping baby, see a recipe or watch a video. The second generation Echo devices integrate with other music streaming services, and works with other smart home devices to turn lights and TV’s off and on. How is Amazon Echo Actually Used? The next phase in Amazon’s product development includes a commitment to developers to easily integrate the Alexa platform into their systems. For example, Philips Lighting began integrating their Hue smart light bulbs with the Amazon Alexa platform, which eliminated the need to change the app or redevelop its existing systems. Another example is Ecobee which makes a smart home thermostat with Alexa built into the product itself. It allows users to control their thermostat in the same way they control any Echo device. With the creation of more Alexa-compatible and other smart home devices, Amazon is making it easy for all the devices to work together across the board. This is an emerging market, and the future is full of potential. You will begin to see other product manufacturers integrating smart home technology into their products. How many people does it take to make Alexa? The Alexa team consists of 5,000 people who have developed and continue to improve the Alexa program. The Alexa team pays attention to how users are using Alexa, and when they notice usage trends, that trend gets a team leader to study it. Amazon Echo remains one of the best smart home products that money can buy.